And then after 6+ months, you realize that by embracing all that this new city and country has to offer, you will be able to appreciate all of the richness it has to offer. And of course, it will never be exactly like 'home,' as it will epitomize so much more — the immense opportunities to grow and develop personally, spiritually, and emotionally. The experiences I have had living abroad for over 2 years, were definitely ripe with enormous obstacles, all the more challenging because I am away from everything I am used too, but also ripe with enormous opportunities, such as organizing two Silicon Valley tours for my Professor and Japanese Kyoto University students, as well as helping to define the growing space of empowerment and diversity, here in Japan. Living abroad, was a lifelong dream of mine. And I was fortunate enough to realize my dream in April 2016, thanks to a fantastic Japanese government scholarship to research women's empowerment and entrepreneurship in Japan. For that, I will always be forever grateful. 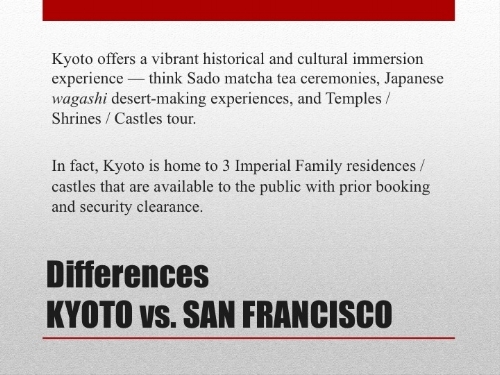 So what are the similarities and differences between Kyoto Japan and San Francisco California? 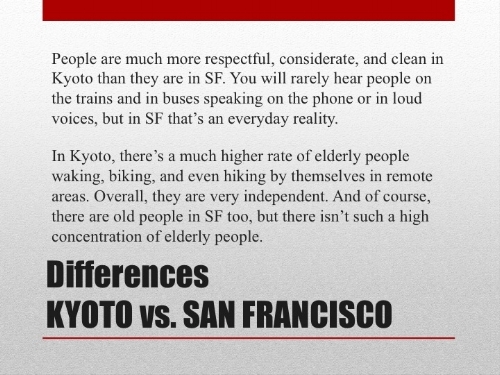 Here’s what I believe are the major differences between San Francisco and Kyoto. San Francisco is internationally renowned as the epicenter of innovation — and for all things technology-related. Kyoto is internationally renowned as the epicenter of Japanese culture and history — after all, it was the capital of Japan for over 1000 years, longer than the entire history of the USA. Now, please enjoy this short article about what I view as the major similarities and differences between Kyoto, Japan and San Francisco, California. If you can think of anything else, please let me know in the comments!